"Well done, little one!" Dawnpetal purred to their adopted daughter. At Emberheart's tease, she narrowed her eyes playfully at her. "Yes, a certain apprentice. But I'm much more skilled at taking down prey and fighting off predators, thank you very much. I'll prove it!" She began to carefully sniff along the undergrowth for potential fresh-kill, and she caught the delectable scent of squirrel. She licked her lips and crouched down low, beginning to slowly stalk forward. She pounced and landed on the brown creature, sharply nipping the back of its neck to kill it. She purred, quite pleased with herself, and shot Emberheart a teasing glare with the fresh-kill dangling from her jaw. 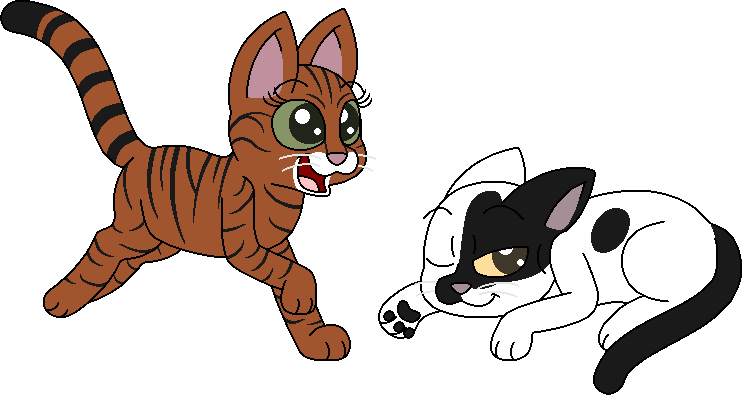 The rabbit saw her just before she landed and ran off, fast, Ravenpaw tried to chase it but it got away. "Oh no..." her ears dropped. "I never insulted your ability to take down predators! Besides, you just proved me wrong," Emberheart laughed. "We've come a long way, I think, the both of us." "You tried, at least," she nodded to Ravenpaw. "Rabbits are too fast for a lot of cats, it's nothing to be ashamed of." She heard a rustling in nearby grass, and fell into a hunting crouch, slowly slinking towards her prey - another rabbit, hopefully unaware of her presence. She pounced, but misjudged her position, and the rabbit ran off into the bushes. She turned back to face Ravenpaw. "But it's no reason not to try again. You'll get it eventually, you'll see." Rustling was heard a few fox-lengths away, and her eyes widened as yet another rabbit was seen, it’s tail flicking about. ”Well, I certainly haven’t had my turn yet,” she growled lowly, beginning to stalk towards it. When she was close enough, she dashed towards it, sending leaf litter flying up into the air in her wake. The rabbit tried to flee once it caught sight of her, but miraculously Dawnpetal was faster. She slammed into the large white creature with full force, knocking it to the ground, and pinned it down while she took quick, careful aim. Finally, she snapped its neck between her jaws, and the fresh-kill went limp. Ravenpaw was determined to try again "My turn! my turn!" and she got at it, searching for a prey, she saw a bird landing nearby and she crouched instantly, and stalked... getting closer... until she was close enough.... and she runs for it. The bird took flight and escaped just when Ravenpaw landed, she was so close! but missed it, she sat and spat angrily, disappointed with herself. "I think I'll happily leave the rabbit-hunting to WindClan. And to you, of course," Emberheart purred, nuzzling Dawnpetal's shoulder. She was about to continue, though she wasn't sure what she would have said, before she was distracted by a squirrel. She chased after it for a few moments before pouncing, and caught it quickly, carrying it back to her family to place it with the rest. "We've each got at least one thing now. Should we keep going, or start heading back?" And of course, the most attractive option for the hungry animal was the youngest and smallest of all of them. Driven by the desire for blood and fresh meat, the predator left the bush where he was hiding and growled, approaching the apprentice. In a second, the fox attacked and pushed down the small cat with his jaws closed around its chest. He pressed one of its paws on the chest of the helpless animal, ready to give her the final bite that would break her neck. Ravenpaw was busy looking around for another prey, refusing to go back to the camp with just one prey, when suddenly, she yelped, the fox took her by surprise, she yelped, but refused to do nothing, she hissed loudly and bites at the large canine, clawing it´s face in the process too, aiming at the eyes, however it was trying to bite her chest and kill her, she wailed, still fighting. Dawnpetal’s eyes grew wide with horror at the fox’s sudden appearance, and her horror only doubled when she saw it attack her precious daughter, the kit she had found fleeing for her life from horrible Twolegs that killed her birth mother, the young apprentice she herself trained. The fox wanted to kill her. But she refused to let that happen. With a fierce, ear-splitting caterwaul, Dawnpetal flung herself at the fox’s face and bit its muzzle, bearing through the foul taste of its blood as it hit her tongue, and tried to aim her wild slashing at the beast’s eyes.